Recently my blog was featured on Good Morning America! I had the pleasure to make personalized lunches for three of the hosts and a few other GMA logo lunches. The great thing about these is that they are all simple enough for anyone to do and you can replace the names with whomever you are making the lunch for. Since my daughter is on summer break, I thought I would share the recipes for these lunches over the next couple weeks. But don't worry, there is plenty of other stuff in store as well! I thought this week I would show you the lunch that would be great fro 4th of July. 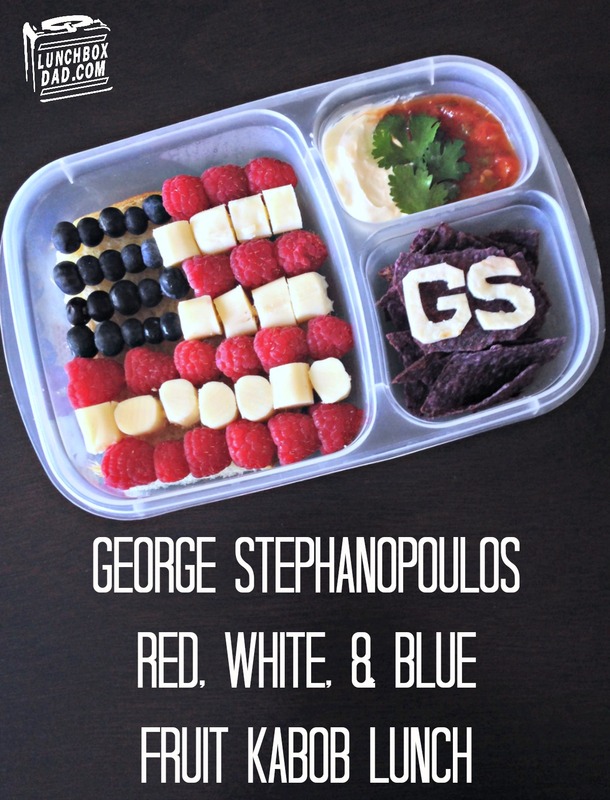 All you have to do to make it your own is switch "GS" for the initials of the person you are making the lunch for. You could also just do the fruit kabobs on a platter for a patriotic party food. This is made in an Easy Lunch Boxes container. 1. Place slice of sourdough bread in main container. Cut to fit if necessary. Put slice of cheddar cheese and turkey underneath. This will be an open faced sandwich. 2. Compare wooden kabob sticks to width of container. If necessary, break to fit. Cut string cheese into small chunks. Slide blueberries, raspberries, and string cheese onto kabob sticks as shown in picture. Lay kabob sticks on top in main container on top of bread. The finished product should make an American flag. 3. Put blue corn tortilla chips in side dish. Break them to fit if necessary. Cut the initials “GS” out of flour tortilla. Put one chip flat on top of other chips and place flour tortilla letters on top. 4. In second side dish carefully put sour cream in half. In remaining half put chunky salsa. Try and use mostly chunks and not much moisture. Put cilantro leaves in the middle, covering up the seam.